Calling all Skiers and Snowboarders: The Peninsula Ski Club will be joining other clubs from the Blue Ridge Ski Council to bring you a fun-filled trip to one of the Northeast's premier ski resorts! Spread across 870 acres on eight interconnected peaks, Sunday River is the third largest ski area in New England, with 135 trails, 15 lifts, and 95% snowmaking coverage. And now if you own an Ikon Pass, you'll save the price of a separate lift ticket. BRSC's annual Winterfest trip complements the Council's popular Western Carnival and Eurofest trips, leveraging the buying power of multiple clubs to secure great deals on lifts and lodging. Plus you'll have ample opportunity to meet, mingle, swap tales, and ski with members of other clubs in our region—always a good time! We'll be staying slopeside at the Grand Summit Hotel with easy access to a variety of terrain from the Starburst and White Cap lifts. Sunday River is a long way from Hampton Roads, so we have a few different options for getting there. Participants can either PYOT (Provide Your Own Transportation) or ride the BRSC bus from the Baltimore area. As an option, those choosing the bus can break up the trip on either or both ends with an overnight stay in the Hampton Inn (or similar hotel) convenient to the bus pick-up point on the north side of Baltimore. 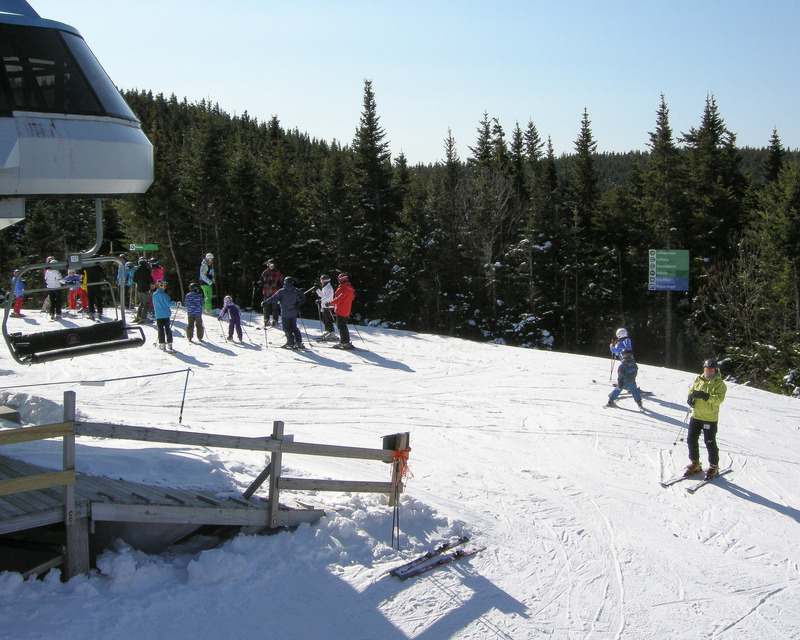 The bus will depart from Sunday River on the morning of March 8 for the return trip. If you're not riding the bus, you can add a 5th day of skiing (Fri.) for just $46. Deduct $185 for non-skiers or Ikon passholders, and $211 if you PYOT. Add $309 for a single occupancy room in the Grand Summit and $72/night for double occupancy at the Hampton Inn outside of Baltimore. $25 discount for sign-ups by Sept. 30, 2018. For complete pricing and additional details, see the Sunday River 2019 trip flyer. Includes lodging, breakfast, and receptions. Please make additional selections below for transportation and lift tickets. BRSC bus originating in Baltimore area. Deselect this option if you will be providing your own transportation. Select this option if you want to break up the trip by spending a night either coming or going in the Baltimore area near the bus pick-up point. Choose either one or two nights. Four days of skiing plus optional Council race. Do not select this option if you plan to use your Ikon Pass or Ikon Base Pass. Good for skiing on Friday. Must be purchased in conjunction with the 4-day lift ticket. Do not select this option if you are riding the bus. Select this option if you hold an Ikon Pass or Ikon Base Pass. The Ikon Pass allows up to 7 days at Sunday River; the Ikon Base Pass allows up to 5. Restrictions apply; see ikonpass.com for details. Discounted dining card worth $100 available for just $82. May be used at the Camp restaurant in the Grand Summit Hotel, Sliders in the Jordan Hotel, The Foggy Goggle, Northern Lights Café, South Ridge Food Court, Barker Food Court and The Peak Lodge. The card can be used for food and drink purchases including alcohol. Not valid at retail stores or the Ship Yard Brewery. Extra charge for single occupancy room.